Economics is my absolute FAVORITE social studies unit to teach. 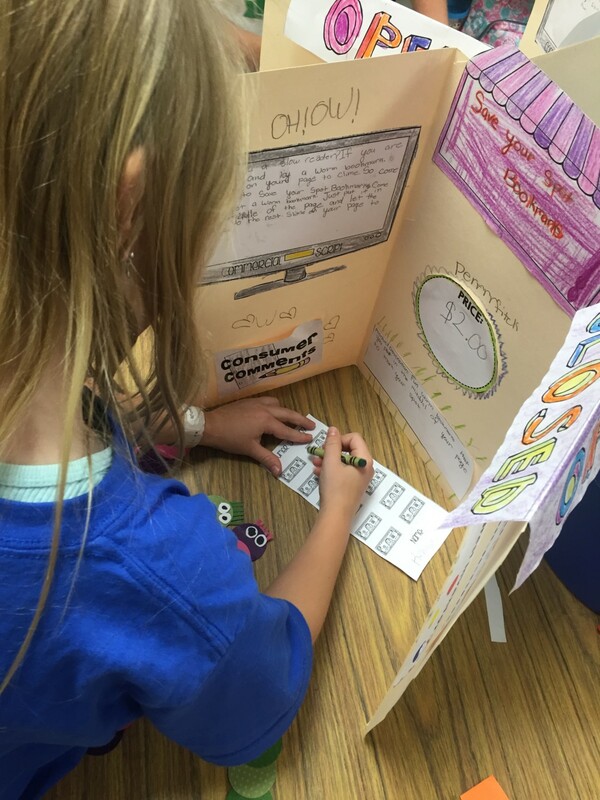 There are so many hands-on activities to do with students and they are so eager to earn and spend money! One of my favorite activities is to end with our "Madden's Marketplace." This is a chance for students to put into action all of the things they have learned about being producers and consumers. 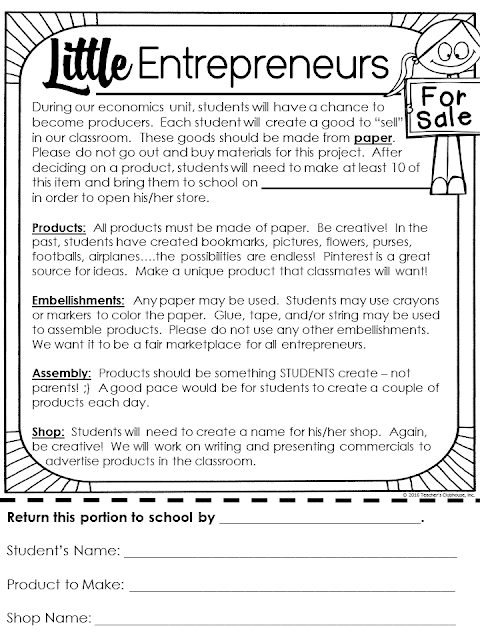 To begin with, I send home a letter asking students to create paper goods. Why paper? 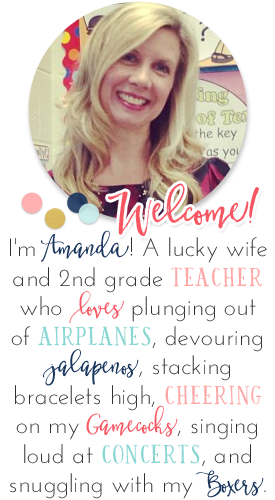 It's something all of my students have at home (or I can easily give them). I want my marketplace to be fair for all students. I'm sure I could let them have the freedom to create any product, using any materials and I would get some amazing masterpieces. I would also get some elaborate (and expensive) items. That's not what I want. 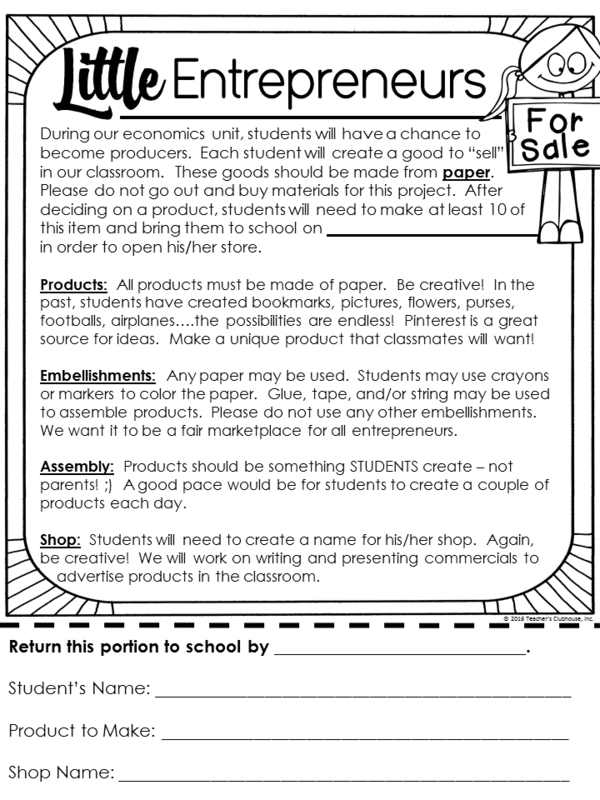 I encourage parents to spend NO money on this and for it to be STUDENT CREATED. I really want them to take the initiative. 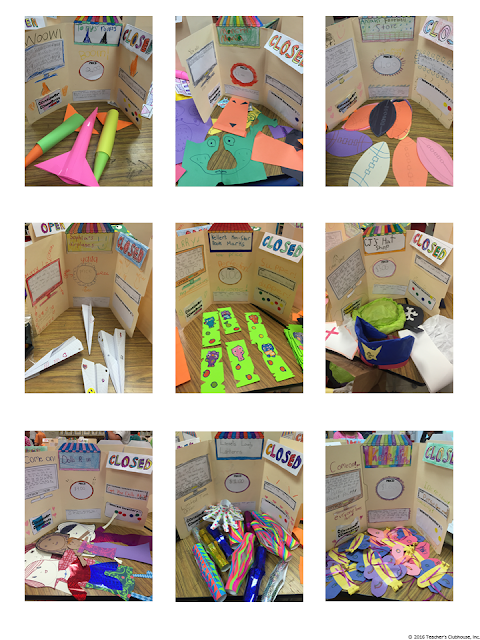 Here are some samples of paper products my students created to sell this year - everything from rockets to bookmarks to lanterns to hats. I incorporate the making of goods into my students' homework schedule, encouraging them to create two products per night. Before the due date, we work on creating "shops" in class. 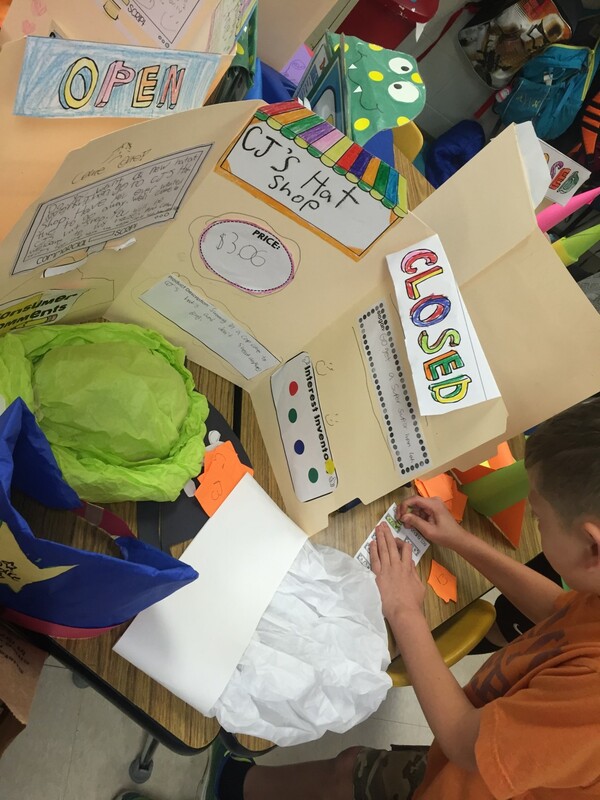 We create our "shop" by gluing two file folders together. The picture below is using legal-sized file folders, but that just happens to be what we had available. Initially, we create the signs for our shops, color the awnings to make them eye-catching. Next, we create open/closed signs that sit atop our shop so we can easily flip the sign to show the status of our shops. We then come up with a catchy slogan. 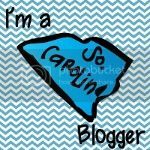 We talk about slogan's we know from commercials. Why did those stick in our heads? We learn to use a play on words, alliteration, onomatopoeia, etc. to make our slogans catchy so consumers will remember them. 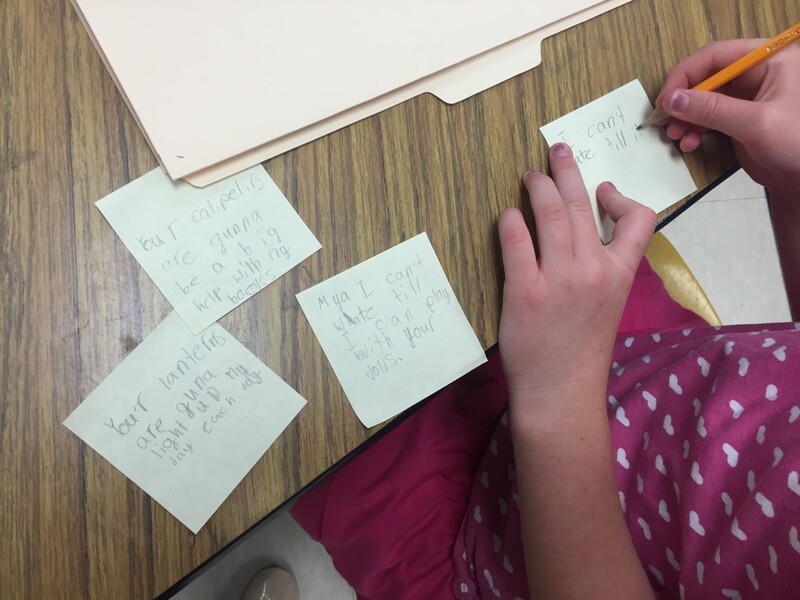 Students each write a product description detailing WHAT their product is and HOW it works or can be used. We talk about the importance of letting consumers know exactly what they are getting. 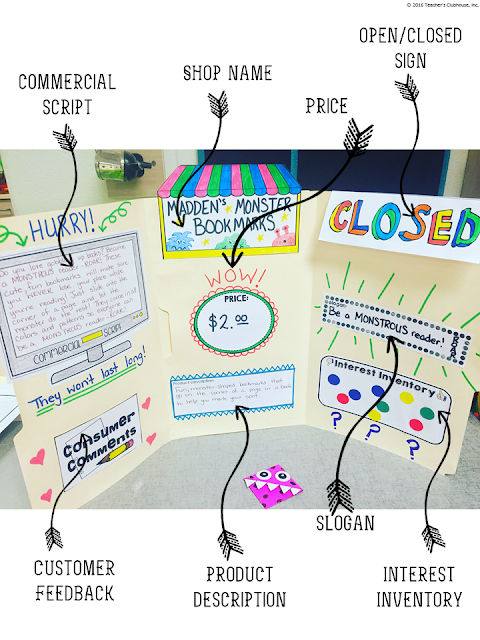 Finally, students write commercials to "sell" their products to their classmates. We use hooks to get their attention, repetitions of our catchy slogans, and persuasion. We also glue on the Consumer Comments, Price, and Interest Inventories, but we leave all of those blank initially. 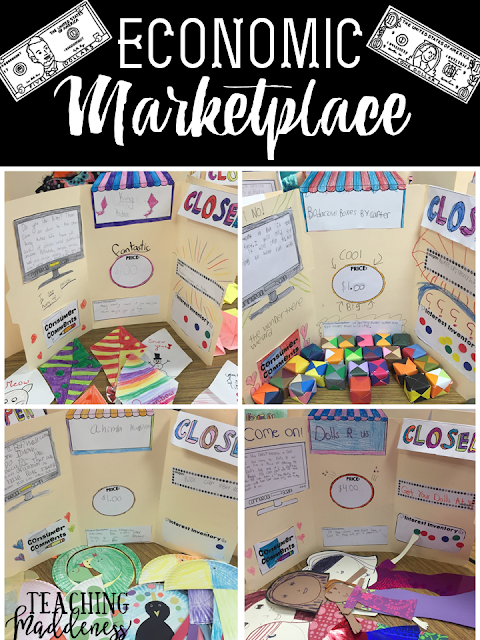 On the day of the marketplace, students set up their shops and lay their products out on display. 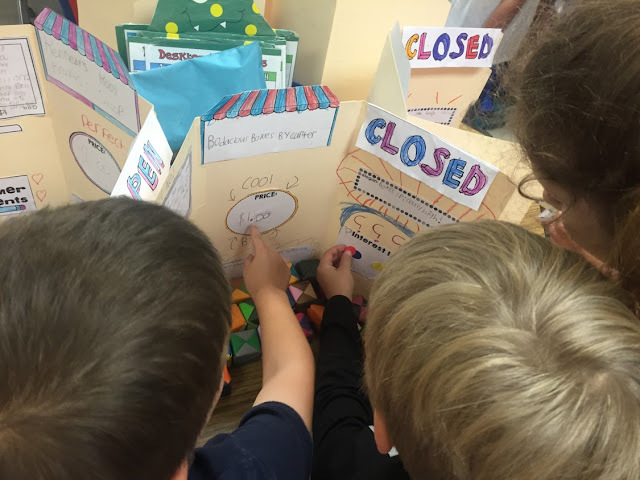 Then, they have a chance to walk around the classroom and "window shop." They are encouraged to take a good look at all of their options, reading the product descriptions and examining the merchandise. After students have had a good look at all of their choices, I give them stickers (I would recommend 3-4). They walk around and place their stickers on the "Interest Inventory" of the products that interest them the most. The results of the interest inventory are used by the shop owners to determine if they have a high demand or low demand for their products. Knowing the demand helps them determine a price for their product. High demand = higher price. Low demand = lower price. The only rule is that all prices have to be in whole dollars. Once prices are set, then students are ready to go shopping! There are many different ways to let students shop. Some years, if I've done economy-based management system, my students will use "money" they've earned to shop. This year, I just gave them all $12 to shop with. 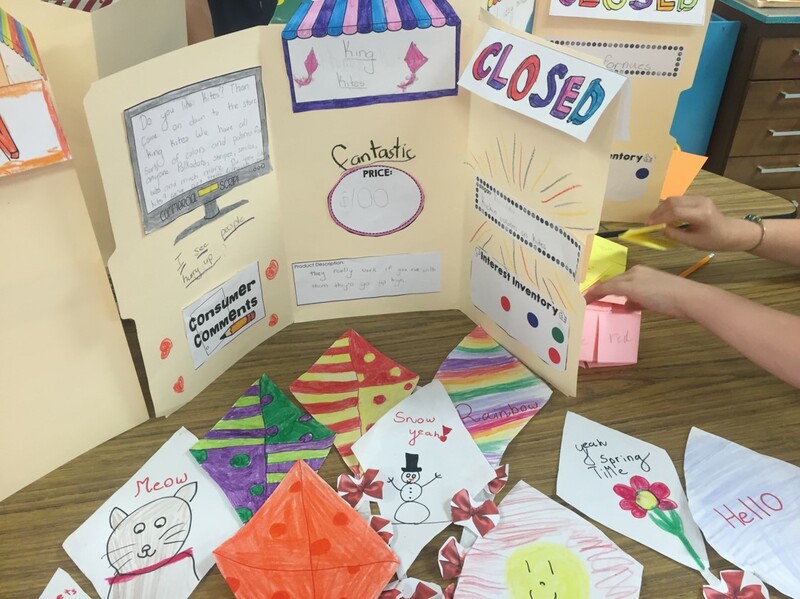 I'm always torn about letting my students split into groups to run their shops (half shop while half work) - it always seems that students don't get to shop at all of the stores in that scenario. To solve that problem, I let all of my students shop at the same time. To do this students create "tokens" to leave at their shop. They create the same number as products they have to sell. For example, if Katie has 10 kites to sell, she creates and leaves 10 tokens with her name or shop name on them. 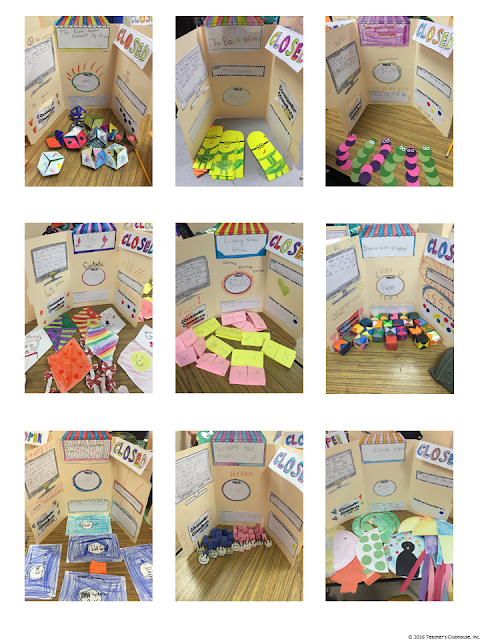 Once each shop has tokens, students are ready to shop. Since there are no workers at the shops to collect money, I give my students "consumer spending logs" with pictures of dollars on them. Since I gave my students 12 dollars to spend, their consumer spending logs had 12 one dollar pictures. 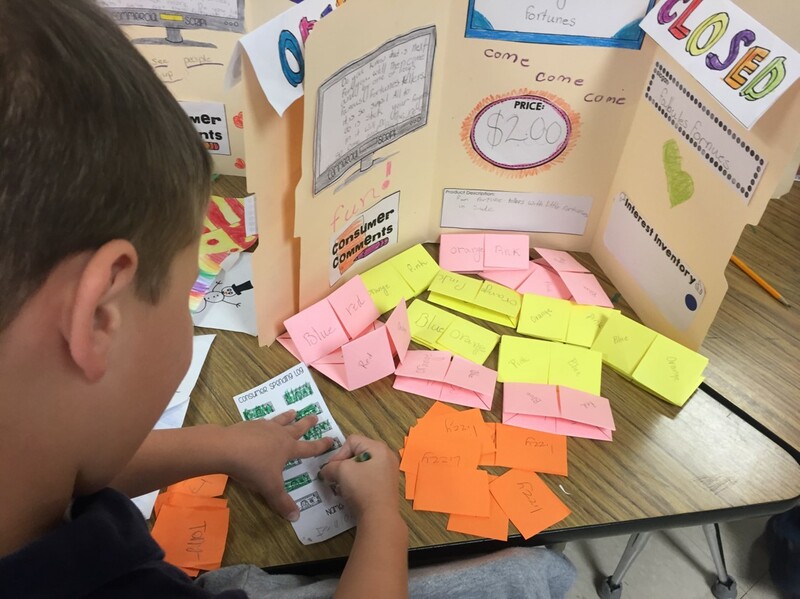 As students go around to the shops, they color in the dollars they've spent and pick up tokens (NOT products) that they will trade in for their purchases once the shops close. Once all of the tokens are gone, that shop is "closed." Once a student has colored in all of the dollars on his/her spending log, they are done shopping. It really works out quite well. After wrapping up our shops, students are often left with some extra products. Instead of having them take their own products back home, I let them put another economics concept into practice - BARTERING! All in all, it is a fun day of learning. 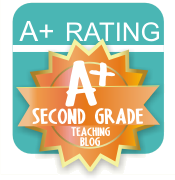 Students take their roles as both producers and consumers seriously and come away with a real sense of accomplishment! If you would like to download this packet of FREE resources to hold your own Economics shop, you can do so HERE. Enjoy! Do you give your students a book as an end-of-year gift? A lot of teachers do - it's a great gift! If you have some extra school pictures of your students around (especially those sticker ones), here's a great idea to add with your book! What kid doesn't want a bookmark proclaiming that they are FINALLY moving on to the next grade!? If you're looking for something else to give your students, how about bubble wands? You can find them all around these days and nothing says summer more than blowing bubbles! :) I picked up six packs from Wal-Mart for $3.88 and then attached these cute little "Have a WAND-erful Summer" tags. Grab these tags from my shop HERE. Just a few more days and we'll all be having a "wand"erful summer, friends! Enjoy!